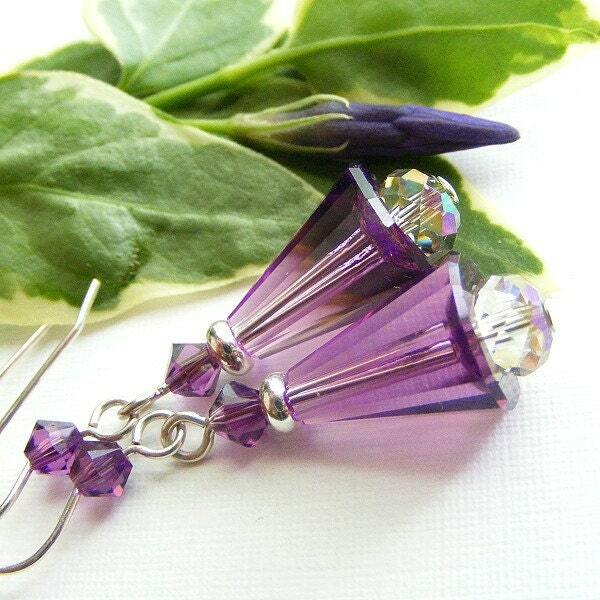 Swarovski Crystal Artemis Earrings in Amethyst Purple and Purple Haze on French Hooks. February Birthday. These faceted Swarovski 'Artemis' beads in Amethyst purple are paired up with Crystal Purple Haze briolettes, which have a beautiful iridescent effect. Length: 1 inch excluding ear wire; 1-5/8 inches including the ear wire. Heart Earrings with Purple Haze Swarovski Crystal on French Hooks. Love. Romantic. Iridescent. Gift. Topaz Czech Glass Earrings on French Hooks. Amber Gold Yellow Twisted Rectangles. Sunny. Om Earrings Featuring Swarovski Crystal and French Hooks. Yoga. Meditation. Zen. Breathe. Red Swarovski Crystal and Hammered Silver Heart Earrings on French Hooks. Love. Romance. Siam. Birthday. Anniversary. Gift. Wire-wrapped Hoop Earrings with Jewel-Tone Swarovski Crystals on French Hooks. Rainbow. Red. Blue. Purple. Green. Yellow. Pink Crystal Breast Cancer Awareness Ribbon Earrings on French Hooks. Swarovski. Hope. Light Rose. Coral Swarovski Pearl and Antique Brass Earrings on Leverbacks. Flower. Floral. Drop. Pewter Angel Earrings with Swarovski Crystal AB Clusters on Leverbacks. Aurore Boreale. Iridescent. Wings. Celestial. Halo.